Fiona Clark, Jenny and Me she doesn't mind that I'm HIV, 1988, annotated cibachrome photograph from a suite of four albums, each 24 x 26”. 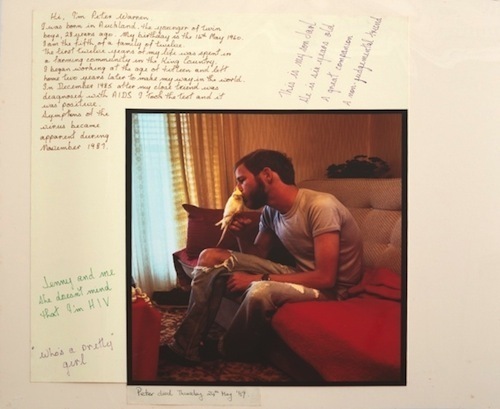 In 1981, the New York Times ran a story with the headline “Rare Cancer Seen in 41 Homosexuals.” Over ten years later—the year that drug-therapy “cocktails” became an effective treatment in slowing down the disease—the first exhibition to respond to the epidemic in Auckland, “Implicated and Immune: Artists’ Responses to AIDS,” opened in 1992 at the Fisher Gallery. That milestone featured work from artists including Jack Body, Fiona Clark, L. Budd, and Fiona Pardington. Carrying forward the discourses that have shaped the social and cultural impact of HIV/AIDS in New Zealand, this reprise of that exhibition powerfully comingles historical documents, a selection of work by artists included in the original show, and additional work by contemporary New Zealand artists offering deliberations on desire and loss.